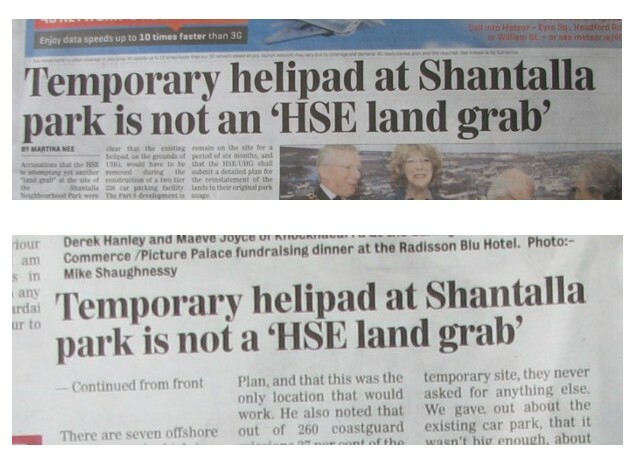 A search on IrishTimes.com returned 1,946 hits for ‘a HSE’ and 92 for ‘an HSE’ (HSE = Health Service Executive), excluding readers’ letters and three false positives of Irish-language an HSE ‘the HSE’. Even allowing for duplications, this shows the emphatic preference for aspirating H in standard Hiberno-English. Haitchers gonna haitch. Pronunciation comes bundled with a lot of cultural baggage, and whether one aspirates H or not can provoke strong reaction. Online you’ll find articles, blog posts, videos, forum comments and Facebook groups insisting on ‘aitch’ and deploring ‘haitch’, while in Northern Ireland it’s a social/religious shibboleth of violent significance, as I’ve noted elsewhere: Catholics haitch, while Protestants aitch. Newspapers should strive for consistent style, but I’m not aiming to poke fun here. These things happen, and the consequences are negligible to nil. Regardless of how it came about, it’s an interesting discrepancy. The history of h-dropping and h-adding at the start of various words is quite a tangle, made worse by the fact that people often feel their own version must be correct and others’ therefore can’t be. I’ve seen real fury directed at the American practice of muting the H in herb, from listeners probably unaware that sounding the H was a later convention. When the Roman alphabet was applied to the Germanic languages, H was used initially for the simple aspirate or breath-sound, which had arisen out of a pre-Germanic or Aryan k, through the stages of guttural aspirate /kh/, and guttural spirant /x/ . . . .
is increasingly being used by native English-speaking people all across the country [i.e., the UK], irrespective of geographical provenance or social standing. Polls have shown that the uptake of haytch by younger native speakers is on the rise. Visiting universities around Ireland, Wells was ‘particularly struck by the expression piː heɪtʃ diː PhD‘ (‘pee haitch dee’) – a pronunciation that would be customary for me and most people I know. In my biology years I would always have said ‘a HLA marker’, never ‘an HLA marker’. I wonder whether aitching H correlates at all with the wine–whine merger – or, phrased another way, whether haitching H correlates with pronouncing wine and whine differently. I’d be interested to hear your preference, ‘aitch’ or ‘haitch’, and what your dialect is. There’s a follow-up to this at Language Hat, with good comments as usual. More on aitching v. haitching from the Australian linguists Superlinguo, who link to their discussion about H on Triple R community radio. Frank McNally’s Irishman’s Diary column in the Irish Times borrows my line for a discussion of Hiberno-English. Tiger Webb has a good article at ABC on ‘aitch’ vs. ‘haitch’ in Australia and its sociolinguistic implications. This entry was posted on Tuesday, November 19th, 2013 at 2:51 pm and is filed under dialect, Hiberno-English, language, phonetics, speech, usage. You can follow any responses to this entry through the RSS 2.0 feed. You can leave a response, or trackback from your own site. Anyhow, I am from Hastings in East Sussex. I was taught at comprehensive schools in a pretty rough area. I always said “haitch”, until at sixth-form college a (privately educated) friend talked loudly about how much that irritated him. I changed to “aitch” pretty much immediately. A vertical hockey stick resembles the letter L.
(the acute accent is the keyboard’s, not mine). Thanks, Jacob! Maybe the pun should’ve appeared in the title. The puzzling line means “can of worms from hell”; as Dw says, the hockey sticks in “haitch-ee-double-hockey-sticks” are capital Ls. I noticed it for the first time in Buffy quite recently, though I’m sure it’s a metphor of some vintage. Ach, I’m in the “aitch” camp. It’s like an itch to pronounce it that way. That will be the preference of Philippine English. I hope I’m a better writer now than when I wrote that comment on Lynne’s post: I stand by its content, but it’s a tad too emphatic. Reblogged this on Love Of Words. I’m uncertain whether any research has been undertaken in Northern Ireland, where, at one time, the speaker’s choice on the haitch/aitch option was (intentionally or otherwise) would have been an explicit tribal signifier. I’m not so certain whether this is so any more. Re Catholics on the H: personal name /Antony/ has variant /Anthony/ – or the other way around. was Catholic and the other one wasn’t. I don’t know how the H the H got into Antony in the first (or 2nd) place, since the Romance versions have none (or do they?). which likewise is H-less in Romance. A mistake belief that the name was connected with Greek anthos (flower). My father was Anthony with “th”, and so is my brother, both of whom were raised Catholic. I don’t know about research on it, but in my own experience growing up in a rural Unionist community in County Tyrone in the 70s and 80s, ‘haitch’ was considered to be a Catholic shibboleth (and I can even remember it being directly connected with the H-Blocks on occasion). That said, I have noticed many Protestants using ‘haitch’ some of the time, as I do sometimes myself. I suspect it’s kind of like (London)Derry in that respect – ‘Londonderry’ was considered correct by the Protestants I grew up around, but ‘Derry’ was often used by them, especially when they weren’t thinking about it. BTW – I’ve always thought ‘haitch’ required more effort, and so therefore I’m in the ‘aitch’ camp. I grew up in South-west England saying “haitch” but always with the idea that “aitch” was the ~correct~ version (the same as how I viewed “brung” vs “brought”), so I said “aitch” in more formal contexts such as on the phone (my surname has a not-phonetically-justified H in it, so I often have to spell it out). Then I moved to Ireland and after several incidents of “aitch” “what?” “aitch” “what?” “haitch” “ohhh” when spelling my name (not sure whether it was wilful or genuine confusion or somewhere in between), I started using “haitch” pretty much all of the time which I still do though I’m living in England again now. The exception is acronyms with H in the middle or end (like NHS or smh) where I use “aitch” (but “haitch” when it’s at the beginning like HE). the same may apply to /an/ or /a/ before sets of initials leading with N, or other letters ordinarily taking /an/ — if, that is, the writer assumes that the reader is deciphering the set fully into words. For ex, (a) “an NP news report” vs. (b) “a NP news report”, in which (b) is read as “a National Post news report”. As far as I’m aware, “haitch” is not used on the areas of the US that have resisted the wine-whine merger. I am from east Fife in Scotland and I say itch. As I have not lived in Scotland for 27 years (though I visit several times a year) I could not say if there is a tendency towards haitch, or aitch, but I am always suspicious when I hear “across the country” I would not assume it was all UK, even when they say so. I also say Jye and not Jay for the letter J. Thanks for the variant datum, Dawn! When I was preparing the post I came across a few other ways people pronounce the letter, but I decided not to include them. So I’m glad you stopped by and lent a necessary complication to the matter. I’ve always said aitch and have never heard another American say haitch. I did work with a woman from Northern Ireland who said haitch, and yes, she is Catholic. I also heard colleagues from England using haitch, so I assumed it was more widespread in British English than it seems to be according to this post. But I was dealing with a relatively small sample size, I guess! — G. Orwell on BBC voice and accent. Thank you for the social difference and hint of violence in the use of haitch-aitch in N. Ireland. I’ve heard similar in regard to the use of the familiar 2nd-person pronoun among Russians; i.e., that its unjustified or improper use is considered a provocation. Likewise for minor lexical differences between Serbian and Croat in the 90s. Re “muting of H in /herb/: muted, yes, and sometimes with a glottal stop too, which is otherwise rare to non-existent in North America. Most vowel-initial words in US English are pronounced with a glottal stop. The glottal stop is widespread in North America. Really Q I don’t hear it. and quite different from what French does to French words of Germanic origin, /hareng/, for ex. However, he was speaking to me in English and may have been compensating. When, historically, did French lose (most of) its aitches? Pretty early on, I think. Spanish, by contrast, requires a noticeable exhalation for the Hispanic /j/, some think arising from the Moorish occupation. Sp. also replaces many initial F’s with silent H’s. Among Germanic languages, is aitch-dropping found only in U.K. English? I can’t imagine it in German or Scandinavian. Standard Danish sometimes has silent h before j and v. I assume these were once pronounced. Currently hjul (wheel) and jul (Christmas) are both [ju:l] and hvin and vin are both [vi;n], the latter being the direct Danish parallel of the whine-wine merger. I read once that North Germany-South Denmark has an Anglo-Danish dialect that can sound “eerily familiar” to English speakers. I haven’t been able to find anything further about same. Re wine-whine: wordplay won’t work if the listener is a non-exhaler; for ex, having a picnic at the beach because of all the sandwiches / sand-which-is / there; not if it has to be followed up with a lead-balloon explanation. 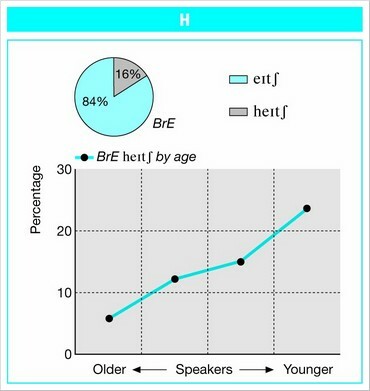 Haitch is still uncommon among the NZE speakers I hear, but the rise in frequency of haitch among AusE speakers has been quite noticeable, at least to my ears. Well, if a haitch hand a ho hand a har hand a Hess hand a hee don’t spell ‘orse, then my name hain’t ‘Enry ‘Ill. A lot of people don’t realise that until the late 60s there was a significant catholic/’protestant’ divide in Australia. Haitch was certainly a signifier of the ‘papist taint’ and we catholics were advised not to use it if applying for a job with a non-catholic employer. Fortunately those days are gone but haitch persists; my unscientific observation would be that it is mostly used by those educated in the catholic school system, which is about 25% of the population. To Australian ears the English pronunciation of vitamin is grating, why the short I? How do the English pronounce vital? A suburb here called St. Vital used to get both the long and the short; more recently mostly just the short with stress on final. That’s in English Canada. Some Anglophones gave L’Acadie an exaggerated 2nd syllable stress, and skewed the vowel as “Lah-KAY-dee”. And so it went. That was long ago. I hear it’s all sweetness and light now. I’ve called the letter H ‘haitch’ all my life and I think it’s something we should hold onto in Ireland! I’m a Galwegian myself. What do you have to say about H-dropping and H-insertion, for example in Cockney speech? Do they always go hand in hand (‘and in ‘and) or do people often do one but not the other? I’m thinking of the Punch drawing in which the woman asks “do you have any ‘ole jam?” and the shopkeeper answers “no ma’am – all our jam is quite new.” I think this may be even more socially significant than the name of the letter H.
By the way, I’ve started a new blog, maceochilanguagelearning.wordpress.com, and I’d be delighted if you could find the time to give it a look. Thanks! I’m an Aussie and I remember hearing the Haitch pronunciation as a child (after being taught Aitch). I asked my dad (catholic-born, turned toff/atheist), he told me it was a sign of going to Catholic school and I should say Aitch. As the other Yanks here have noted, we are an aitching people, though we are generally all for initial /h/ in contexts other than H and herb, and I think this has been true for centuries. But the whine-wine merger in American speech is a fairly recent matter; my wife and other Southerners of her generation do not have it. So I think there is no particular connection between the two except that Ireland is a reservoir of both. By no means. 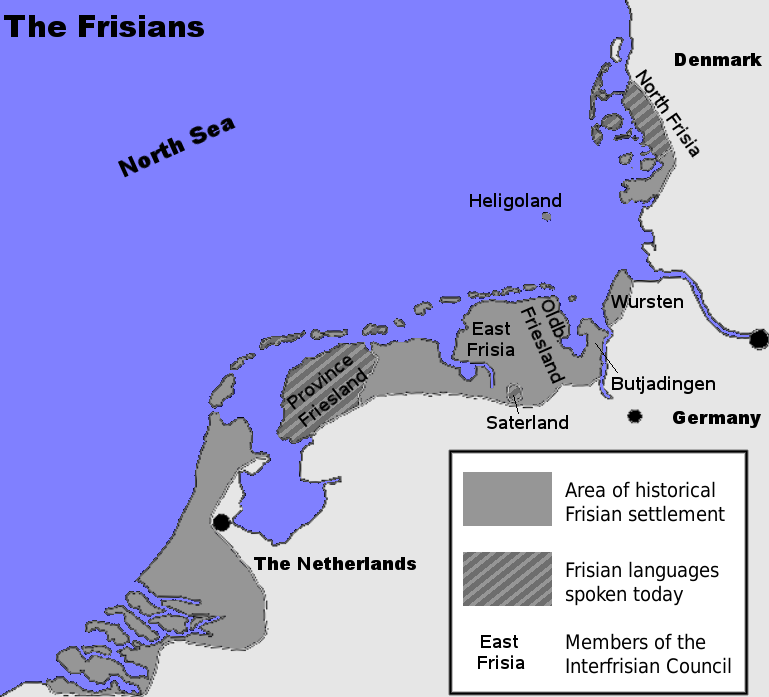 Western Frisian (the kind in the Netherlands) is the largest variety, and is mostly spoken on the continent. See this Wikimedia map. I speak freshwater US English as my first language. The first time I can recall hearing haitch was from a Welshwoman. Indian English often has “haitch”. It also has the wine-whine merger, with the exception of some Marathi speakers who post-aspirate “whine” as a spelling pronunciation. Thank you all for the reports, impressions and anecdotes from Scotland, Northern Ireland, the Philippines, India, New Zealand, Australia, and the USA. Oh, and Galway. It was very interesting to read them. seajay23, vital in UK English rhymes with title. Vitamin is spoken with a short vowel sound in Ireland too. maceochi: Well done on starting your new language-learning blog. It looks very interesting. Leonore: I don’t know how much haitching there is in England, or how it’s distributed geographically, but I imagine it’s more widespread now than ever, if the trend Wells observed continued apace. Roger: Re. Russian forms of address, this BBC article on a similar aspect of French may be of interest, if you haven’t seen it. John, thanks for your observations on the wine–whine merger. I’m from Dublin and I say “haitch” always (and distinguish between “whine” and “wine”). When I moved to England I got slagged – nicely – a lot for pronouncing the letter R as “or” rather than “are/arr” – not sure if that is as defined in the Anglosphere as (h)aitch. I’m from Canada originally and as fas I know I’ve always said ‘aitch’. In my pre-conversational days I lived in the East — Charlottetown; plenty of Scottish / Irish influence in that part of the world, but I moved to Toronto at 6 y.o. Toronto was traditionally staunch Presbyterian — lots of Orange Order influence — but I wonder, given it was already quite multicultural when I was a kid, whether that could mean anything. I say ‘aitch’ but then I’m a posh Edinburgher – my mother speaks Fife dialect and says ‘itch’. Caoileann: I had a similar experience of good-natured slagging when I spelled things for two Scottish friends I was living with in Prague. ‘R’ was among the problem letters, and I think my ‘A’ sounded like babytalk to one of them. Leif: Thanks for your report from Canada. I guess we’d need more numbers before reaching any conclusions about the Presbyterian influence on aitching in Toronto. Siobhan: Interesting! I rarely hear the ‘itch’ pronunciation, but am glad to know it persists in dialect. I’m an Aussie and I used to say ‘haitch’ as a kid, although I probably said ‘aitch’ too. We are talking 1960s here. It would never have occurred to me that it was a sign of being a Catholic (or ‘Cattle-Tick’ as we used to call them); it was just an ordinary pronunciation, perfectly logical given the sound that it’s supposed to represent. I was barely even aware of any difference between the two pronunciations. However, as I’ve grown older (and since I’m living overseas) unfortunately I’ve grown out of ‘haitch’, which I’ve left behind like many other youthful habits. Bathrobe: If it’s unfortunate, there’s no reason you shouldn’t re-adopt the pronunciation, at least as an occasional variant. Language change in action! As for “haitch” being a marker of Catholicism or Catholic education: it seems the correlation in Australia is much less strong than in Northern Ireland (and even in NI it’s not a certain predictor). Recent data on this from either location would be welcome, but I didn’t look for it. From another Aussie. Looking back to the 50’s, I recall that haitch was pretty much standard for the kids that went to the convent school. But it was also very common with friends who went to the State school in my area. For the Protestants it might have been a “class” marker, to a degree. At some stage in my university career I noticed that aitch was the standard, so I switched to that; just as I started to say film, instead of fillum. Actually, when I was back in Australia in December, I had occasion to phone a Federal government department. Since it was near the Christmas break, I was answered by a recorded voice that, among other things, gave the name of a building where department had offices. As is common in Australia, the building was named after a person, and the name happened to contain H as an initial. When saying the name of the building, the lady in the recording clearly said ‘haitch’. So it appears that this usage is widespread enough in Australia for adults to use it in public announcements without any qualms. Bathrobe: Saying it automatically to yourself is a good sign! As is its use in public announcements – thanks for letting me know about that. Gerry: I imagine it’s common enough in certain areas for people to switch from one to the other once they notice what the prevailing norm is. Epenthetic ‘fillum’ is still fairly popular in Ireland, but I don’t have any data on its distribution or whether it’s being sustained. R, A, and Q have Irish pronunciations too. Thanks, Molly. I didn’t know about ‘Q’ (or your blog, to which I’ve now subscribed). Quite simply – A I T C H – spells Aitch, not Haitch. If you add an H to the beginning of a word that does not have one, you are pronouncing it outlandishly. It signifies someone who simply doesn’t understand the English language to me. It’s not simple at all, and to insist on “aitch” as the only possible correct form suggests a misguided and narrow view of language. English has many dialects and varieties, each of them appropriate to their own domains. What’s considered to be correct varies with time and place. Same as Hello is pronounced “hellow” not “ellow” which is a colloquialism. I suppose haitch can be said to be a colloquialism, an informal pronunciation, just like “innit” or “nuff” – it’s in the exact same ilk, and is an indicator of class. No, it’s not the same at all. “Haitch” is not a colloquialism in Ireland, nor is it an informal pronunciation – it’s the name of the letter H in the Hiberno-English dialect. Not every country has the same markers of class or the same prestige variety of usage. I’m an ‘aitch’ man, and hail from Glasgow originally; now domiciled Down Under, where ‘haitch’ is common. I’d heard that in pre-Norman English, ‘haitch’ was used, but in order to be more ‘French’, it became ‘aitch’. I prefer the idea of haitch, though I’ll use aitch, as I was taught. I think the idea of a letter name that doesn’t include the sound the letter’s used to write is odd. Duncan: There’s been a lot of h-dropping and -adding in various places over the years, much of it seemingly for appearance’s sake. Halceon: W is an odd one in that respect. My paternal grandmother always complained about the use of ‘haitch’, despite her having an Irish Catholic mother and living in what is now the Republic of Ireland during the 1930s and 40s. In Irish the letter is called ‘heis’ (pronounced ‘hesh’) and aspiration (or lenition) is a feature of the language, which has influenced Hiberno-English. As Unionists in Northern Ireland have traditionally been wary of the language, hence it being seldom taught in Protestant schools, this would have increased their aversion to ‘haitch’. Growing up in Singapore, I found ‘haitch’ was the norm among Singaporeans, as well as Malaysians – in Malay, it’s called ‘hec’ (pronounced ‘hetch’). In Indonesian, it’s called ‘ha’, as in Dutch, and Dutch speakers of English also aspirate it as ‘haitch’. In Romanian, unlike most other Romance languages ‘h’ is not silent, perhaps due to Turkish and Hungarian influence, even with Latin-derived words, so ‘hiperactiviate’ is ‘heeper-aktivi-ta-te’. Very interesting notes, Ken, thank you. I didn’t investigate the letter’s aspiration in other languages and dialects, and am pleasantly surprised by your report. Tá fáilte romhat, Stan, you’re welcome. If your name were ‘Seamus’, the vocative would be ‘a Sheamais’, pronounced ‘a haymish’ – ‘Hamish’ comes from the vocative of the Scots Gaelic equivalent, ‘Seumas’. Interesting that dainichi mentioned Danish, as the Danish word for ‘what’ is ‘hvad’ (with the ‘h’ silent, apparently) whereas in Swedish it’s now spelt as ‘vad’. The name of the letter ‘h’ itself is aspirated – the day that Sweden changed to driving on the right in 1967 is known in Swedish as ‘Dagen H’, with the ‘H’ (for ‘Högertrafik’ or ‘right-hand traffic’) being pronounced as /hoː/ (‘hoh’). English is the odd man out among the Germanic languages in this regard, as in so many cases, the legacy of Norman French influence.